Hello!! to all you hangers-on to what seems to be a fading way of logging one's adventures. I still love reading blogs, but I'm quite aware of the hypocrisy of how little I write on my own anymore. So how goes it? I'll be honest. The first two months of the year were a bit of a struggle for me for no good reason. I'm sure you're familiar--your head seems to be in a fog, you're going through motions, you're just not yourself. I was not fun to be around. I was mopey, I didn't care, I needed caffeine like I never have before just to make it through the work day. And then I happened upon a book. On the left is the paper cover, and the right is the actual book cover. Fun, right? I used to be amaze balls at that--ordinary, little things making me happy. And at some point, that stopped. And I didn't even realize it had happened. But this book? I read the first chapter and was nodding along and exclaiming "Yes!!!!!!" in my head. I think I had too much...noise, so to speak. I felt like I shouldn't have things, that I should be a minimalist. I felt that as I'm forty it's not "proper" to have blue nail polish, or to get excited about things covered in glitter. But you know what? I LIKE my quirky little collections of random things. They make me smile. So maybe Marie Kondo would give me a smack at how many things spark joy for me, but I don't care even a little bit. Can I have blue nails if I want? 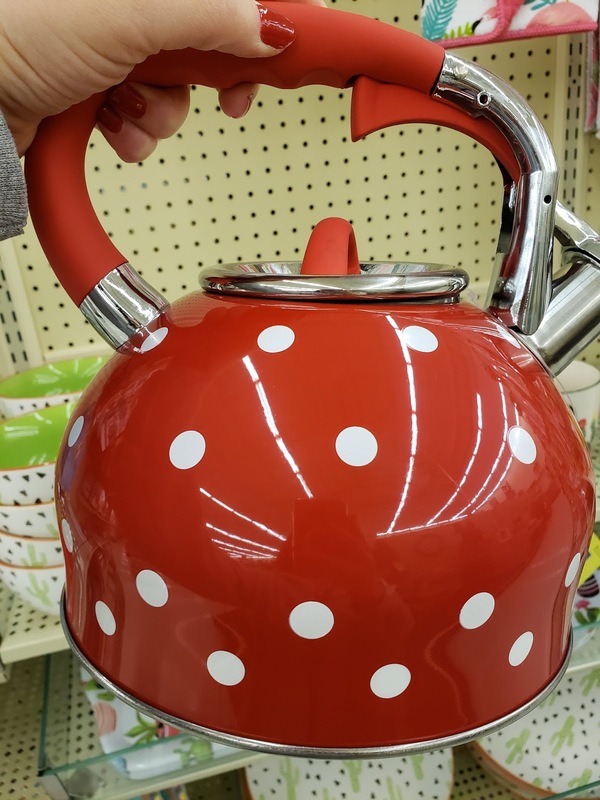 Yes, and with polka dots, too! And the glitter? I bought a new pink sparkly phone case that I keep turned over so I can see the glitter (as opposed to the little notification light). I even took this book with me to jury duty yesterday (which, as we all know, is the direct opposite of joy). I really feel like it's helping, and all it took was a small nudge from Yester-Bee saying "Hey, Future Self, wanna, hang out again?" 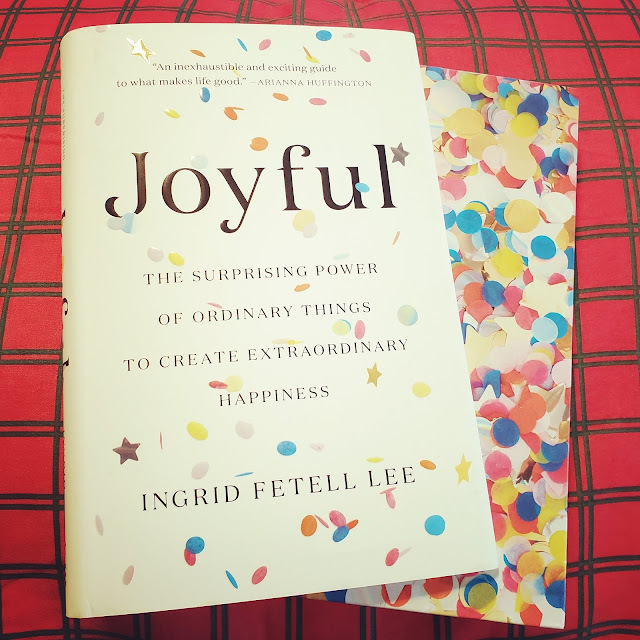 But seriously, if you feel a little like you're in a rut, or that you've set up camp in the doldrums, give this book a look-see. I call these my Gumps. 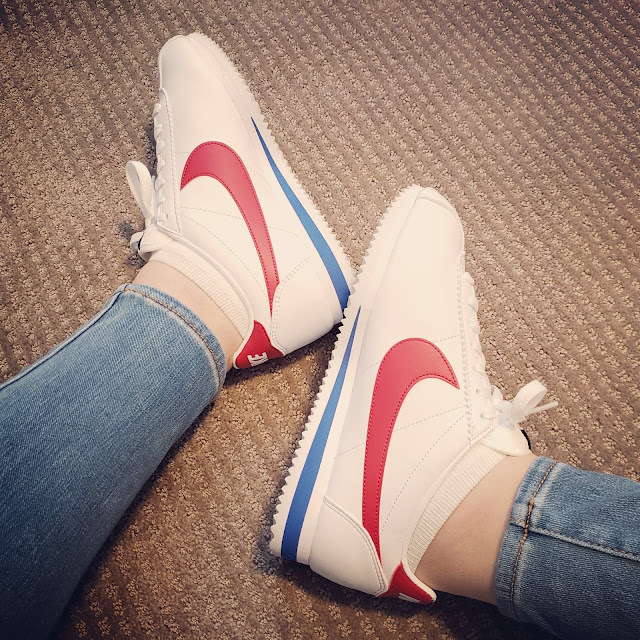 And every time I put them on I think "Ruuuun, Forrest, ruuuuuuun!" I don't think this needs words. Thank you, Hobby Lobby. 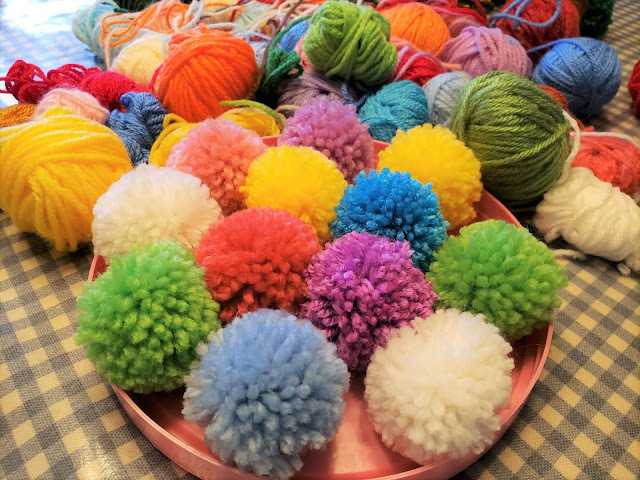 I needed a little bit of color at my desk at work, so I spent Sunday making pom-poms. I didn't stop at this here dozen...they're quite addictive once you get going. Just don't look super close at these embroidered necklaces, m'kay? So the necklaces. I don't remember when I bought the kit, but I busted it out this weekend. 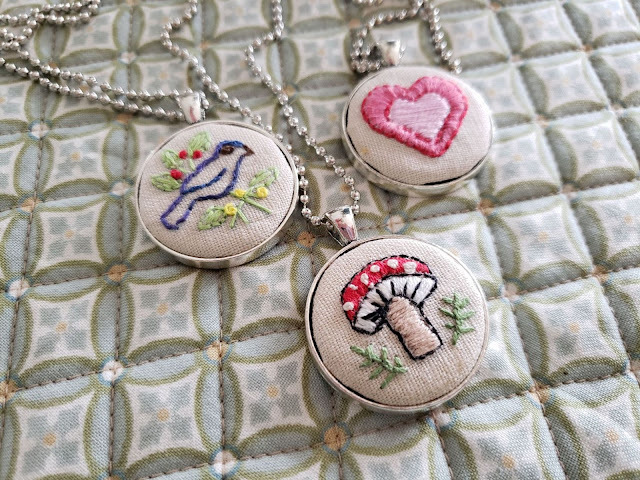 And while I was stitching these, I kept thinking "Wow. One year ago I was in the hospital, too dizzy to open my eyes, with tingly hands and muscle weakness. And today...I'm just as not-great at embroidery as I was before all that happened." 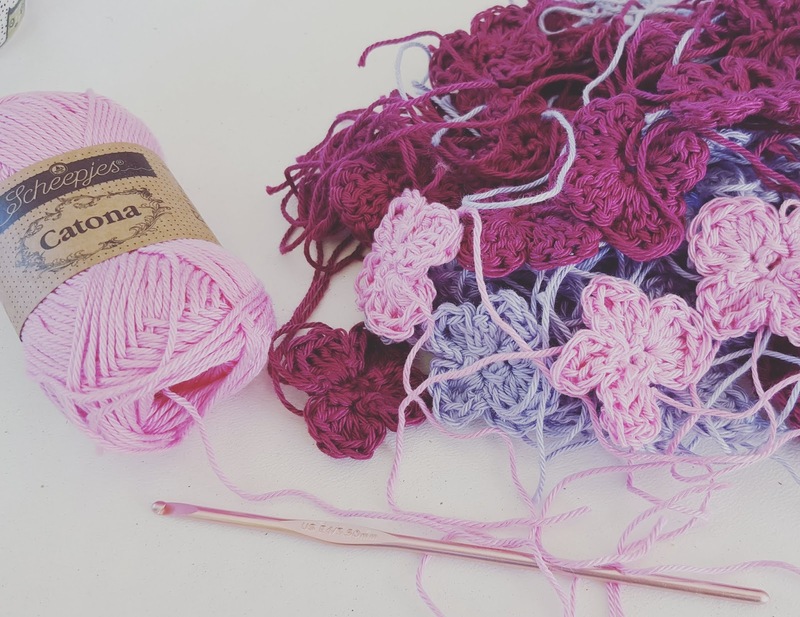 I remember making granny squares felt like a triumph, and I needed multiple naps like a toddler. And while I remember every second like it was yesterday, I still can't believe it's been a year. I was honestly fearful I wouldn't be able to return to work, make things, drive...you get the idea. And maybe all that led me away from myself, if that makes sense. But thanks to a moment of serendipity involving a candy-colored book, I feel like I'm on my way back. In my stash, I had a ball of practically-neon green yarn that I didn't use for a project and had no idea what I would ever use it for until Little Nephew (A-train) was talking about his favorite video game Minecraft. 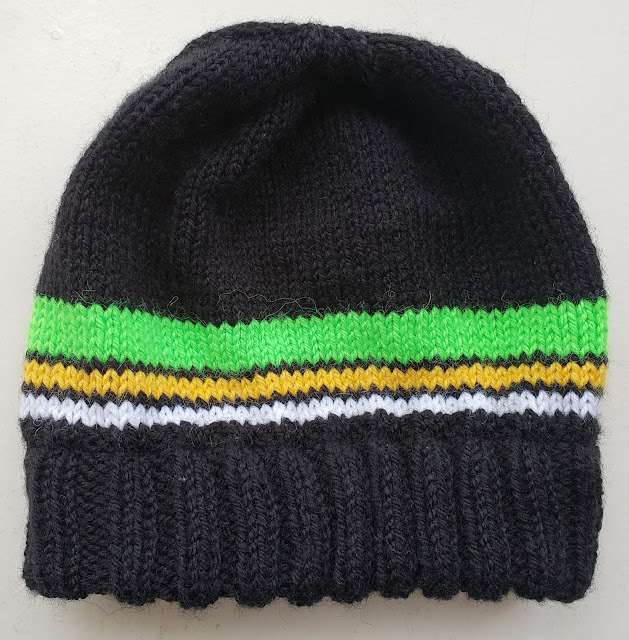 The color reminded me of those creeper thingees that lurk around (I know less about this game than I do about rugby), so I thought I'd put those onto a hat. 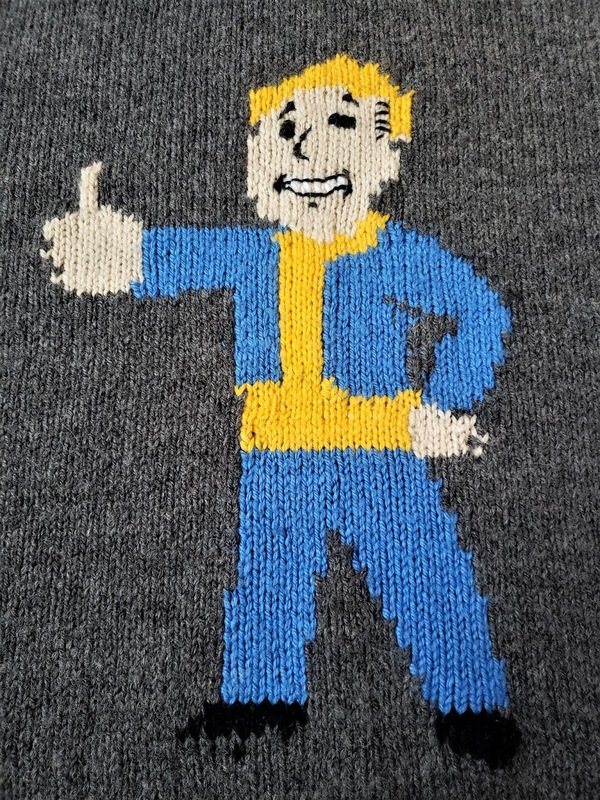 I couldn't find a pattern for exactly what I wanted, but I did find this one for the colorwork part (which is really all I needed). I like the look and feel of a double-thick brim so I started off making that (using the same method I described in Big Nephew's hat), and then incorporated the pattern chart a couple rows into the stockinette section. I reeeeeaallllly like how it turned out. There were only a few sections of long floats to trap, and it's only a nine row chart, so this section went quite quickly (and on 16-inch circulars it was easy to keep the colorwork at a good tension). 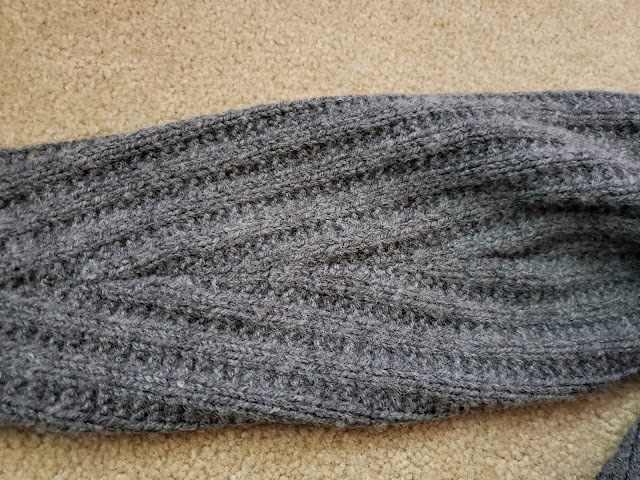 I did not like the look of the decreases in the pattern online, so I knitted even to where it looked right, and then just did some evenly spaced decreases. He looooooooved his new hat, and said to me last week (in such a sincere manner I felt it in my heart...but everything he says is so sincere) "Aunt Bee, let me tell you. I would not be making it through this cold weather without this hat. It's nice and warm and fits perfect" (we had a wicked cold snap last week). Following up on this, I got a phone call one night. "Aunt Bee. 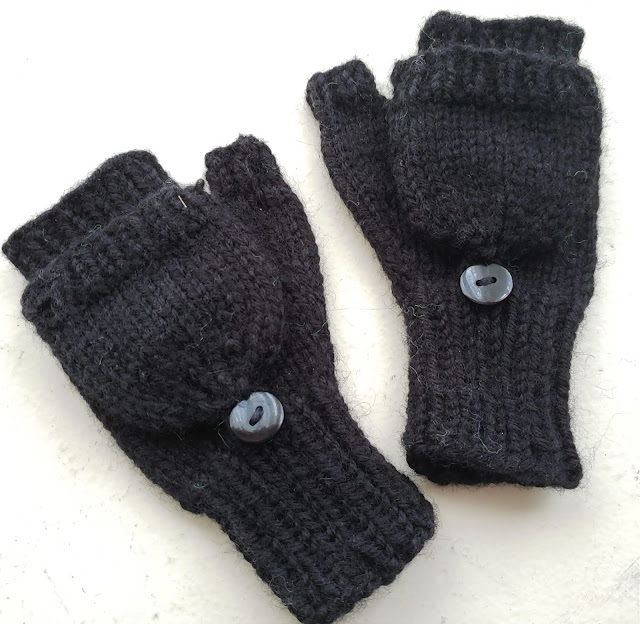 Could you please make me....gloves with the tops cut off...and this little flippy thing to make them mittens? And can you make them so they kind of match my hat?" I found a simple enough pattern on Ravelry to base these on (I made my wrist ribbing longer instead of using stockinette, and didn't do the finishing work she did). 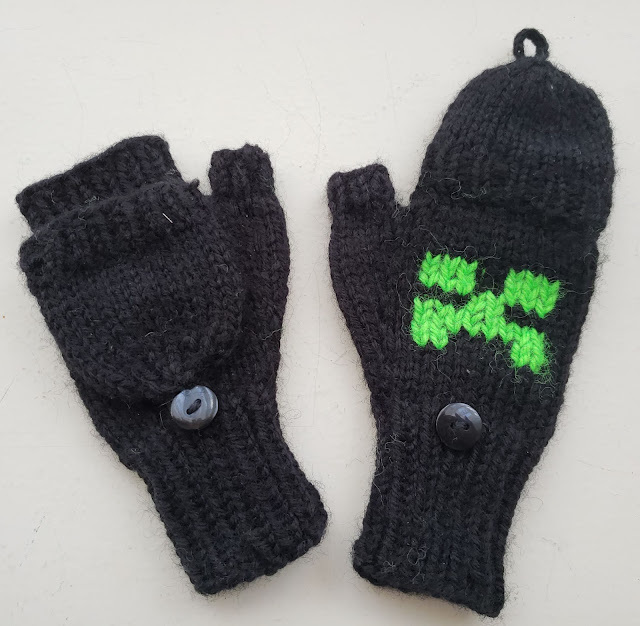 I didn't think I had enough green left to get both mitts, so I went with black yarn (for these, what he further described as, "ninja mittens"). Oy. Let me tell you. I rarely (as in almost never until now) work with black yarn for anything beyond straight knitting for the same reason I hate sewing with black fabric--it's really tough on the ol' peepers. What should have been a few evenings of work took a good bit longer because working with black yarn in lower light is rough (at least for me). Plus I have this perfectionist streak in me so I frogged some and thought way too long on some parts. But, they ended up just how I hoped they would. 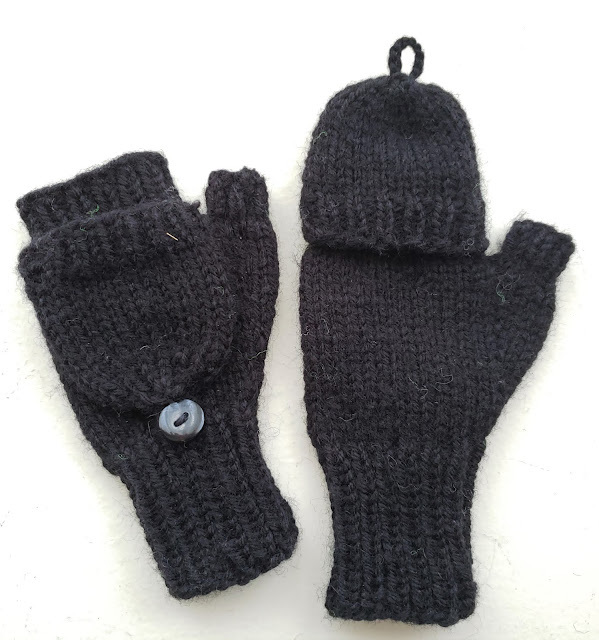 As this was my first time making these there was definitely a learning curve here, and a few things I might change up (I'd make the ribbing at the top of the mitts longer, and make the flip top a row or two longer as well). But I'm largely pleased with them, and more importantly, A-train loved them. He said, as he gave me a hug, "You deserve this hug, Aunt Bee." I am fine with this as a payment method. After knitting this sweater, I had a TON of yarn left over (in everything but gray). And after knitting that sweater, I felt like knitting only small projects. I enjoy knitting hats, but there's only so many hats one person can have (I know, that's an arguable point, but as a person who generally does not wear hats it seems nonsensical to keep piling them up). For some reason, I rarely make things for my nephews. I think it's because they have that "growing boy" thing going on for so long I worry that they'll outgrow what I'm making before I finish. But hats? They stretch. A lot. So they'll last a while to make a few evenings of knitting worth the effort. Especially when the colors you have are somehow perfect for their interests. 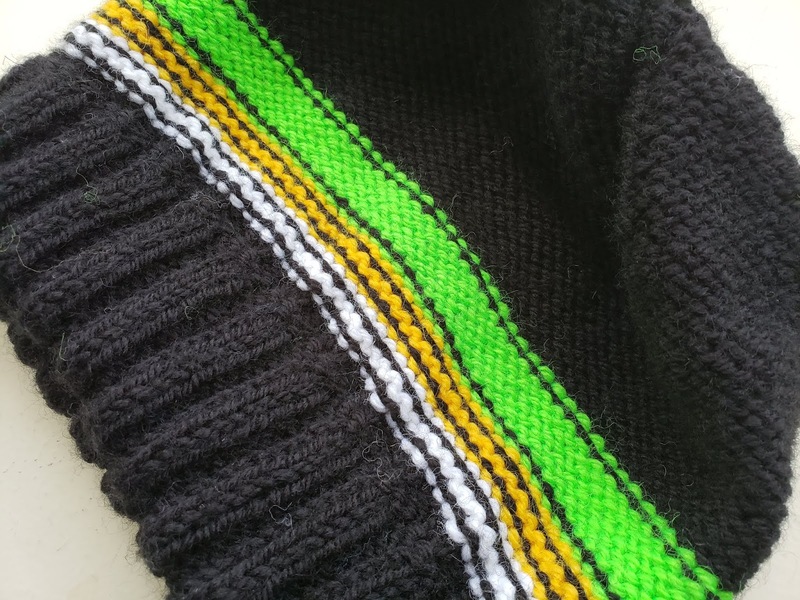 I made it with a folded brim for comfort and warmth, and went for a small band of stripes so it would be a little more low-key. My original plan was to make the whole thing ribbed, and I don't remember right now why I decided against it when it came to the stripes...I'm going to say it would have something to do with the decreases lining up. I didn't follow a pattern for this as it's the most basic of hats. Provisional cast on, knit the brim twice as long as you want it, then pick up the cast-on edge and do a three needle join (like a bind-off except you're not binding off). Knit the hat until it's as long as you want it (generally about seven inches), and then do some evenly placed decreases. Boom. Done. I do like the swirly look of individual leaning decreases instead of the straighter look of paired decreases. I really like how you can be staring at a thing and not see the fuzz on it until you go to post the picture. It's my favorite. I suppose it's reversible depending on the look you're after (and as he's a teenager I don't know if he'll care if it's inside-out or not....or even notice, really). 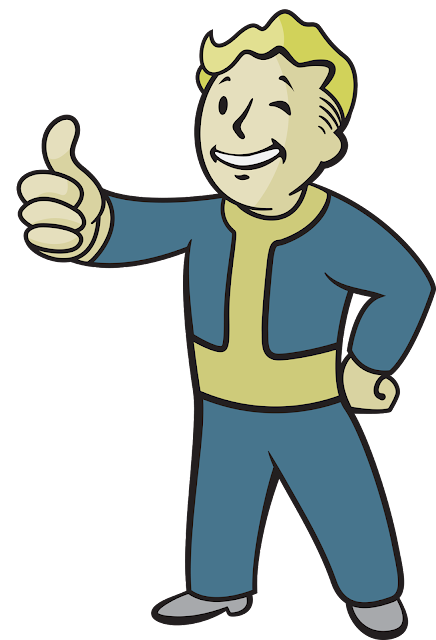 I'm going to do Little Nephew's in a separate post as he threw in a special request and you'll be here all day if I put it all in one post, and I'm sure you have better things to do (though I can't imagine what they could be). Um...hello? <tap tap> Is this thing on? Isn't it funny how almost four months can go by without a post and you don't even notice it because time flies, and then one day it hits you that it's been ALMOST FOUR MONTHS since you last posted, and how does that happen and what have you been doing with yourself anyway? It's the first year I haven't posted anything Christmassy, or gone on and on and on about how much I love Christmas lights, or how I can't believe how big the nephews are, and so on and so forth. But I very recently gifted a sweater to someone, and thought "I must remember to blog about this" and then thought "Hey, I haven't done that for a while!" So here we are. So this sweater. I feel like I've got my sea legs when it comes to stranded colorwork, but intarsia was still twisting my gut and causing a "Gah! NO!" reaction. But when someone says "Hey, is this a thing you can do?" and it's someone you care about, you say "Of course I can!" and then hide all the angst because where did this overconfidence come from? I made a few practice swatches, carefully selected my yarn for color, ease of caring for it, and suitability for color work, and then set to. I used the Stitch Fiddle pattern-making site to get my chart (after carefully counting and figuring the size that would be best and all other sorts of mathy things that raised my blood pressure). And then I had other people cross their fingers (I couldn't cross mine--I had to knit) and got down to business. 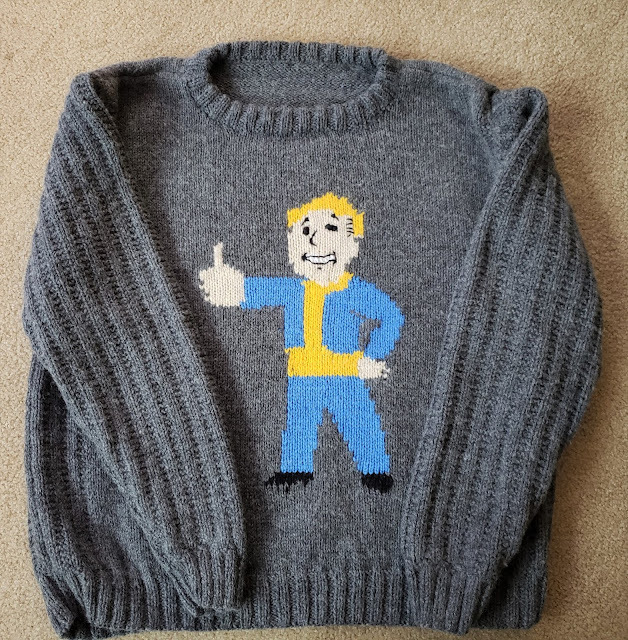 After a LOT of swearing and muttering of phrases like "I am going to burn this" and "No wonder there's a boyfriend sweater curse" I was as finished as I could be if I hoped to maintain my sanity. Intarsia itself is not the absolute worst I found (once you get your yarn management sorted--I used those little plastic bobbins you can find in almost any craft store that carries knitting supplies). The issues I had came from inexperience and there are definitely things I would do differently next time (yes, I said next time, but not for a long time because this was enough for a while). For example, I'd go with a thinner yarn to get a lighter weight sweater, which would also allow me to use a MUCH more detailed chart that would give me a picture I'd be happier with. 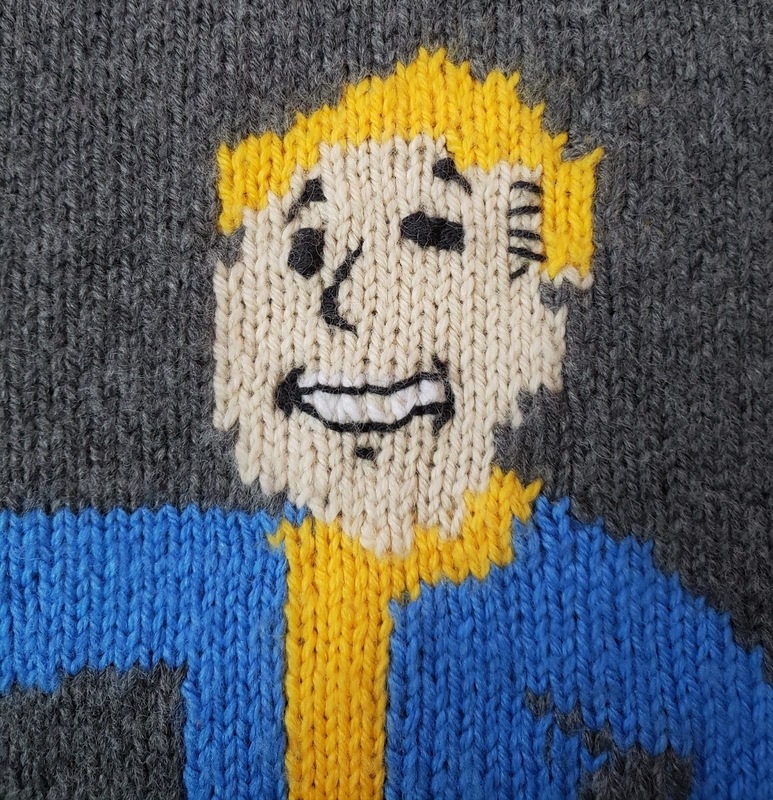 So then I wouldn't have to embroider a face in sock yarn so that it wouldn't scare small children. I'd also look for a top-down pattern as I was very worried about the length of this (even though I measured like a lunatic) and I like the option of making something as long as you want. I love that 'broken rib' stitch on the sleeves--it added some nice texture, and when I sewed everything together it came together really neat. For the collar, I didn't want to leave the ribbing raw, or unfinished, as I personally find that scratchy. So I made it twice the size it was supposed to be, and then sewed it down for a nice soft edge. 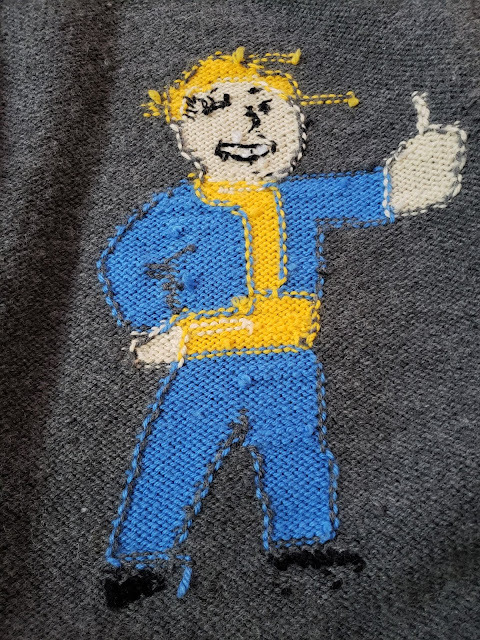 I contemplated doing the graphic in duplicate stitch, but didn't want a heavy weight blob on the front center; in retrospect I'm glad I didn't as it would have looked too puffy. Besides, the inside looks kind of neat. I probably overdid the weaving in of the ends, but as this was a wool/acrylic blend (I used Plymouth Encore) I wanted to make sure they were really in there). Better safe than apologizing for a sweater falling apart, amiright? So that's that. I'm over my fear of intarsia, I've learned a LOT in the making of this sweater, and most important--it fits! 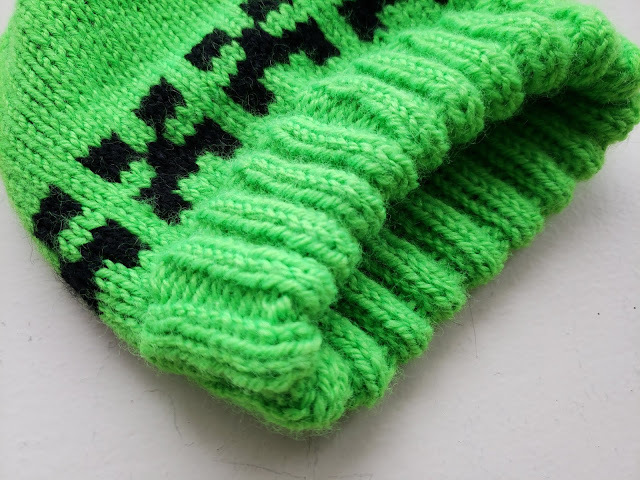 While I do love simple, fast projects, when it comes to knitting I prefer a little oomph. Whether it's self-striping yarn or new techniques I've never tried, I like having something different to look forward to as I work. My knitting goal for the year (is that a normal thing to have? Do other people set those?) is to become...I'll call it functionally literate...at color-work. 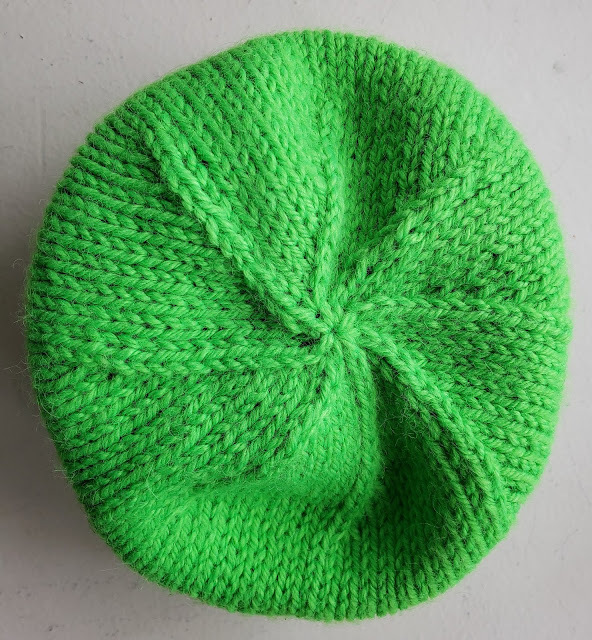 And the Fimmel Hat was a great project for this (as long as we ignore the strands of yarn that kept wanting to get involved with each other instead of minding their own business). The pattern for this was available only if you bought the kit, and the shop has since shut down, so apologies for teasing you if you were interested (but if it makes you feel better I got the kit on sale). I believe the gold color was supposed to be more of a khaki color, but it still works. The yarn is 100% alpaca, which was a new fiber to me. 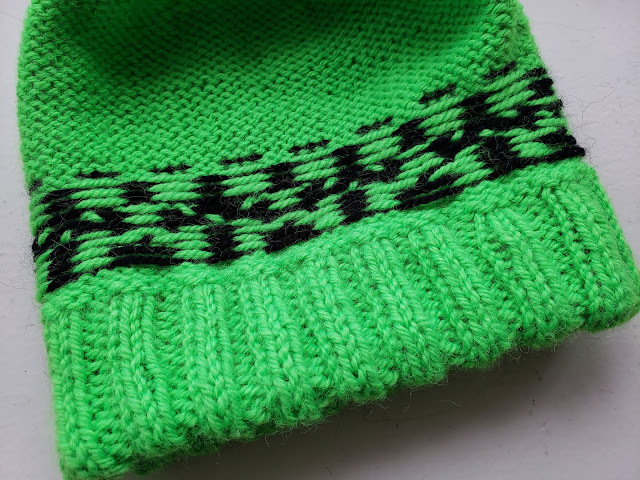 I've always read that alpaca loosens a bit and can stretch way out, but this hat is small enough of a project that it wasn't an issue (though I certainly wouldn't make a sweater out of straight alpaca). Anyway, I like the little bit of haze the fiber gives. Now with stranded knitting, the most important thing to remember is to not pull those floats too tight or everything goes kerplooey. I was so focused on this that as I did the decreases and knit the top, I forgot that the hat would be cinched shut, and that those floats could be shorter. 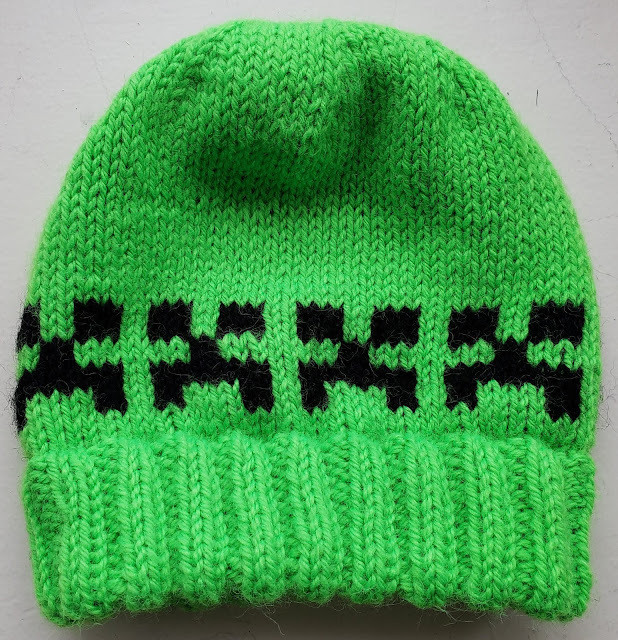 So I had to do some fancy fudge work to finish it off (but you can't tell because who turns a hat inside out and looks at the bind-off?). 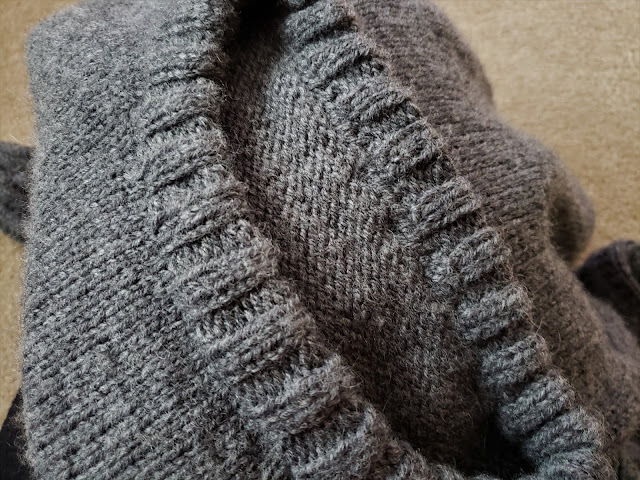 As I knit more things like this, I realize that one of my favorite things to do is to turn it inside out and look at the floats (in a completely normal and non-gloaty sort of way). I neglected to take a photo with this on, I'm just now realizing, but it fits just right. 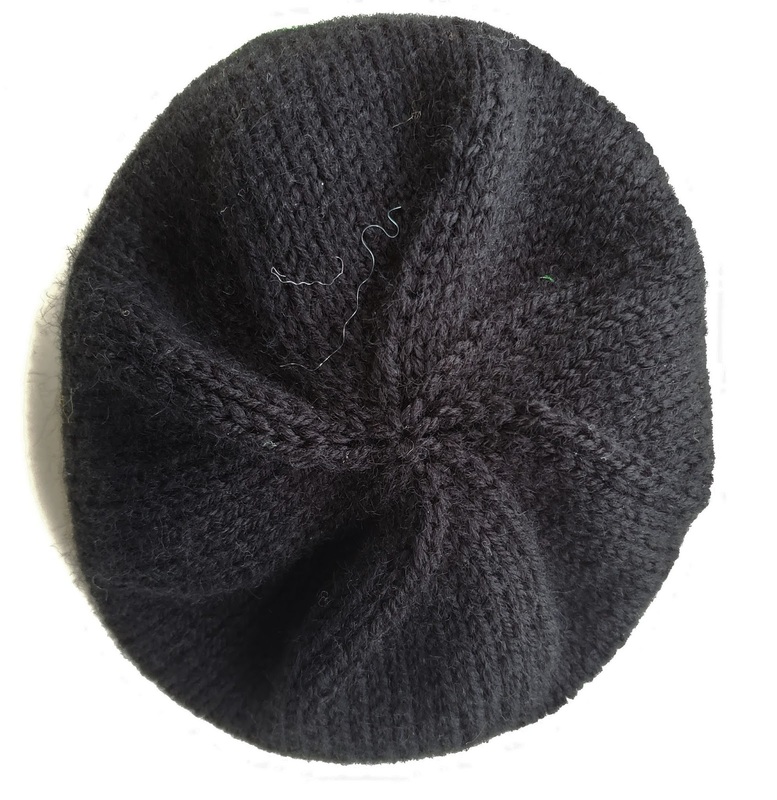 The looseness of the alpaca is nice as it keeps the hat from being smashed on my head and is something I can wear without my hair getting that look about it, but it's not so loose that it falls off. The pattern also came with a design for wristers, but I haven't attempted those yet. There were a lot of colors in this (though no more than two in any row), but they did love to twist and twine, and I very nearly chucked the leftovers in a rage due to far too many detangling sessions. When I went on a knitting retreat back in October, I bought some beautifully squishy yarn. 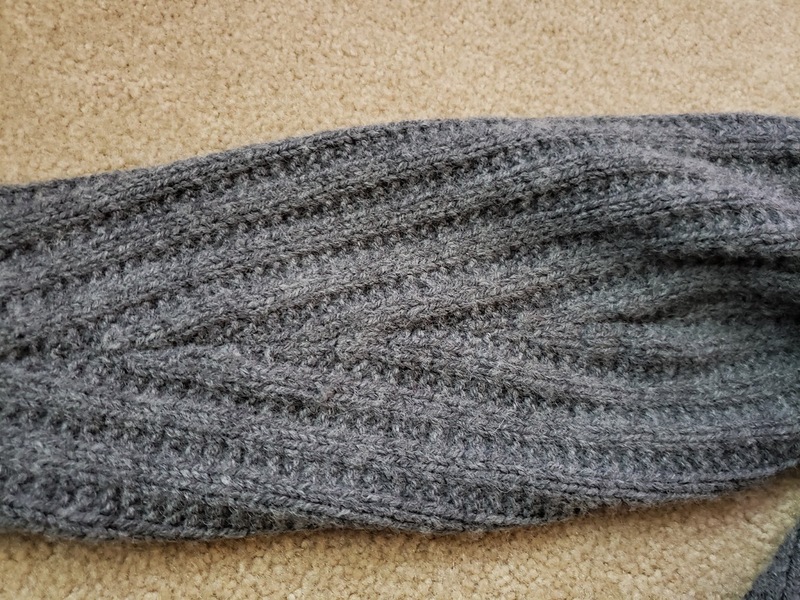 Due to other projects, and certain unforeseen circumstances, it took me a really long time to cast it on for the pattern I had bought to go with it. But now it is finished, and blocked, and the first day of appropriate weather I'm wrapping myself in this and strutting around. Disclaimer: this color was nearly impossible to photograph accurately. The pattern is called 'Broken Waves.' I bought a paper pattern, but it's available on Ravelry as well. It's a looooooong triangular shawl, predominantly stitched in garter stitch, with a cabled and ribbed border. 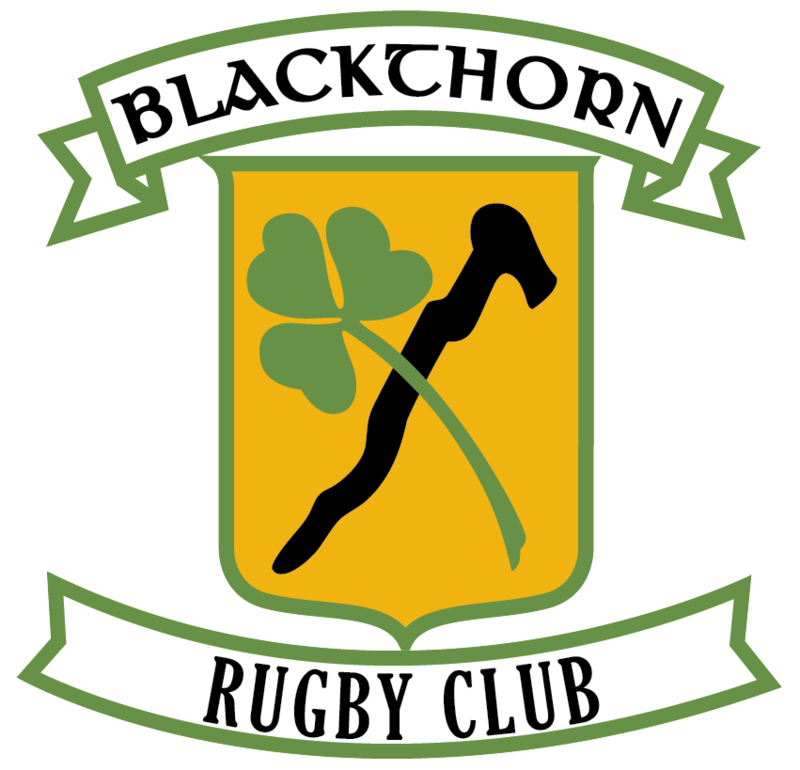 This is probably the closest approximation of the true color. The shawl is knit as a long triangle (almost like half of a diamond), and then stitches picked up along the edge. Then these picked up stitches are knit, one at a time, as you go back and forth across the border. The cabling is supposed to stop at the point, but I have issues, and I knew that the lack of symmetry would bother me. So I just kept going with it. Who can resist a little Alice in Wonderland, especially when you're eternally twelve years old? I'd like to say this shawl was a total pleasure to knit, but it wasn't, until I made a minor change. I say a minor change, but I ended up knitting the body of this shawl twice. As the pattern was written, increases were done on the very edge of the shawl. When it came time to pick up the stitches it made for a very messy edge. And I just couldn't have that. So I started over, but did the increase as a kfb, and did it one stitch in from the edge. This made everything much neater. I also omitted the yarn overs because I didn't like how that looked, either. BUT, once I got going with those changes, this was fun to knit. Now back to stitching my sweater. Because while it's steaming outside, one doesn't wait until sweater weather arrives to knit a sweater, amiright? I made this wreath a while ago, and every time I walk by it I think "Yep, must share that" but I always forget. But today I break that streak. Last year I bought a kit for a shawl, but didn't really love it, so I used the one set of yarn for this blanket, and then used the remainder to make this wreath, as when I looked at the colors I could think of one thing and one thing only. Hydrangeas. I found a pattern online (I think it was this one, but it was a while ago so I'm not entirely sure), and just stitched and stitched and stitched until I ran out of yarn (which is Scheepjes Catona, by the way), and was left with a giant pile of hydrangea petals. I found a styrofoam wreath and wrapped it the yarn that wasn't flower colored. It wasn't that much fun, let's be honest here. Once the wreath was wrapped, I placed the flowers (and did it again, and again, and then again, because I just couldn't decide) and then finally pinned them down. Then I realized the pins were mighty short, so I added hot glue for extra security. I ran out of steam, and just did not feel like making leaves for green, so I bought this floral...thing...and then cut that apart and glued pieces here and there. Not my favorite thing ever, but it's definitely reminiscent of hydrangeas, which is what I was going for, so it's a win, right? I mean...they can't all be gnome wreaths, can they? Hiya! Thanks for stopping by my happy little hive. I love to make things, especially bags. I like cheery colors. I like green Swedish fish and red freeze pops. And I firmly believe that a cup of tea makes everything better. I hope you pull up a chair and visit it for a bit. Happy trails! Jump In the (Photo) Pool! Been inspired by something you've seen here? Add it to the pool!